This Phantom Backpack is a capacious, versatile carrying bag. It features padded back, padded shoulder harness and waist belt making it comfortable to carry it. The bag has one large compartment, which could easily fit a whole uniform and helmet, there is also a front compartment, which can easily fit a Toy Soldier armour plate. There us a velcro patch for sticking your favourite patch to, and also features MOLLE webbing on the front pocket to allow additional accessories to be added. A hydration bladder can be stored in a pocket within and has a feed hole on the top of the backpack. 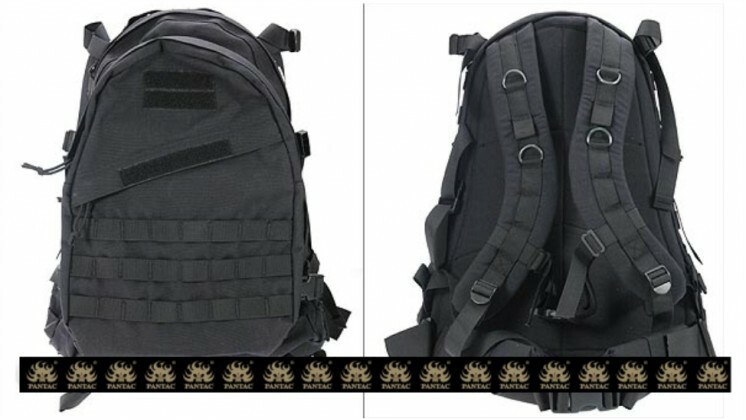 This backpack made of INVISTA CORDURA nylon ,, along with UTX clips and heavy duty YKK zippers. It comes with a separate pouch which can be attached or attached with the clips. Size Backpack dimensions pproximately 470mm x 350mm x 150mm. Additional pack is 330mm x 220mm x 100mm.